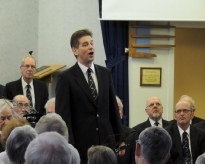 Choir practice takes place every Tuesday evening at 7:30 pm in Trinity church, Fell Lane, Keighley. If you would like to join the choir please telephone Paul Harris on 01535 675880 or call in and listen to the practice. You will be very welcome. Mozart and McCartney, Porter and Puccini, operatic choruses, folk songs, spirituals, hymn tunes and songs from the shows, from the rousing sounds of ‘Nessun Dorma’ to the sensitive yet equally thrilling ‘Sanctus’ from Schubert’s German Mass, and the poignant messages in ‘You Raise Me Up’. The choir were privileged to be asked to sing with the Bradford Town Band at the Lord Mayor’s appeal in 2009. 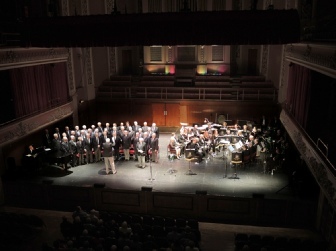 Airedale Male Voice Choir were in concert with Bradford City Brass Band at St. George’s Hall, Bradford, for the Lord Mayor’s Appeal in aid of Sprinkle Sunshine Charity. This was the first occasion that the Choir and Band have performed together, and a very enjoyable sound the two made. To quote a member of the audience ‘I want to tell you how very much I enjoyed the concert’ and the writer continues ‘everyone in the civic party on Friday evening, especially those who had never heard the choir before, were utterly blown away’. 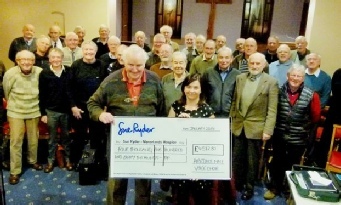 The choir present a cheque for £4,582 following their Charity Concert at South Craven School, Cross Hills, Keighley. 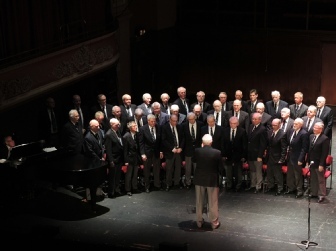 Matthew Binns, community fundraiser at Manorlands, said: ‘We are extremely grateful to the Airedale Male Voice Choir for its support.